It is undeniable that peanut better is delicious. Peanut-butter has an endless variety of different uses whether you spread it on sandwiches with jelly or munch on it in Reese’s pieces. The exquisite possibilities are endless and there is nothing which quite matches the spread’s unique blend of peanuts and salt. If you think peanuts or peanut butter may be the reason you’re breaking out, try cutting them out of your diet in all forms for one month. Where does peanut butter come from? What many people do not know is that peanut butter can be traced all the way back to ancient Aztec civilizations. Clear evidence has been found that this peanutty snack has been around long before we thought possible, and will surely be around for many years to come. All of this may be beginning to sound too good to be true. Indeed, peanut butter has its own fair share of unpleasant side-effects. One particularly nasty consequence of indulging in this snack is its possible relationship to acne. We present you with a guide of peanut butter’s effects on the body. While some of these are beneficial, they also include some less pleasant effects – particularly when it comes to your complexion. 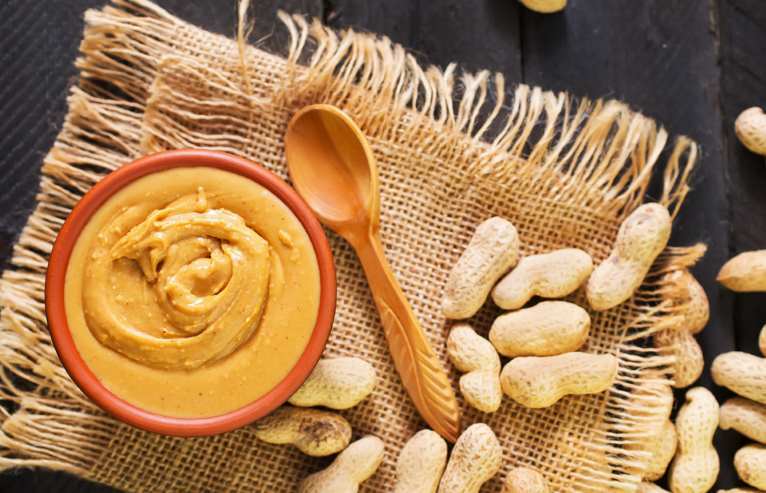 We thus outline the four reasons why peanut butter may be causing your breakouts. And because this may seem like a bit of a disappointment at first, there are also some alternatives to this tasty spread. Before dismissing it from our daily diets forever, let us first take a look at its benefits. Because it contains nuts, peanut butter may at first glance appear to be the perfect, healthy snack. However, a closer look proves that this is not actually the case. The truth is that it all comes down to fat. A tablespoon contains roughly eight grams of fat. Fret not. Although this may seem alarming at first, about one-fifth of this fat is saturated. Saturated fats are the type of fats that are most easily processed by your body. As this type of fat does not affect your heart’s function, you may indulge in peanut butter all you want, even if you suspect that your heart is prone to mild disorders. In addition to this, the peanutty snack also contains a percentage of monounsaturated fats which are high in protein, magnesium, vitamin E, vitamin B3, and folate. These ingredients hold various benefits for your system, such as being able to decrease your cholesterol. More relevantly, they can also do wonders for your complexion. It also carries resveratrol, which is nevertheless more easily obtained from plenty of other foods, such as fresh or fermented grapes (a good reason to not skip that second glass of wine at dinner). To sum it all up, peanut butter contains a myriad of healthy components, such as various vitamins, magnesium, antioxidants, monounsaturated fats, protein, vitamins. As a whole, this combination doesn’t sound bad, so what could go wrong? Peanut Butter is Not as Healthy as It Seems! Upon further examination, it appears that peanut butter’s nutritional properties may not outweigh the harm it does to your skin. There are four main problems attributed to acne that may be caused by peanut butter. If you are prone to acne this may unfortunately be the end to your love for this delicious spread. Nothing tastes as good as fresh and glowing skin feels, right? It is undeniable that peanut butter contains a large percentage of fat. Half of these fats are monounsaturated and luckily another one-fifth represent saturated fats. Although there is thus a significant amount of healthy fats in peanut butter, the rest of the fats are unfortunately poly-saturated ones. What does this mean for your skin? An abundant amount of omega-6 can result in serious breakouts. Here’s the reason why: one of the biggest problems with omega-6 fats is that they directly cause inflammation in sensitive areas. The arachidonic acid is mainly to blame for the bad reputation of this kind of fats. Due to the inflaming effect that omega-6 fats has on your organism, clogged pores may manifest, resulting in severed sebaceous gland oozing sebum. The consequence of this can be an initially invisible wound inside of your body. The way this happens is that as soon as your system absorbs omega-6 fatty acids, it allows your body to start producing prostaglandins and cytokines. These cause the wound to flourish, at which point your immune system is meant to intervene. Unfortunately, this essentially turns into a battle between the omega-6 fat and your immune cells. Indeed, the more omega-6 fats that you have, the harder it is for your organism to fight the inflammation. You may be particularly prone to this if your immune system is not functioning as properly as it should be. You would also be prone to it if you have a high intake of omega-6, as a resultt of eating a lot of peanut butter. Basically, it is for this exact reason that if an individual consumes too much peanut butter, it results in an abundance of these fats and quickens the inflammation. This happens because you need an adequate amount of omega-3 fats to balance and diminish this occurrence – the omega-6 fats rile up irritations, while omega-3 fats put a halt to them. Essentially, the two types of fats counter each other. Therefore, ideally, your aim should be to possess as much omega-6 as omega-3, or even aim for as much as a quadruple amount of the latter as compared to the former. Otherwise, you risk that the linoleic acid in omega-6 fats, that is transformed into arachidonic acid by your organism will lead to inflammation after inflammation. What does that mean for you? It will lead to recurring and long-lasting acne. This ratio is, however, difficult for many people to obtain and to consistently sustain. For instance, most Americans have twenty times more omega-6 acids than omega-3 acids! This irregular balance of acids may result in systemic inflammation, which essentially makes your body suffer from minimal, yet permanent inflammation. Indeed, the way you will experience this is in the form of bothersome, long-lasting acne. It doesn’t sound like peanut butter is worth the trouble, now, does it? But Why is Peanut Butter to Blame for Excessive Omega-6 Fatty Acid? Your immune cells play a key role in protecting your body from harmful toxins. You may still be thinking that your immune system may surely be able to cope with small quantities of peanut butter’s damaging effects. Think again. Ingesting even a tiny amount of peanut butter per day may not be as harmless as it seems. The amount of peanut butter necessary for a wholesome spread over a toast amounts to more than four grams of omega-6 fatty acid. This abundance of the fats will provide your body with far too much omega-6, making it nearly impossible to keep a proper balanced ratio of omega fats. Are omega-6 fats all that bad? Indeed, they can be, as long as you are failing to maintain the golden ratio of fatty acids. The bad news doesn’t stop there. In the case that you consume a lot of omega-6 acids, your body may begin to experience something as dreary-sounding as ‘small intestinal bacteria overgrowth’. What might that be? This process represents an abundance of harmful germs being overproduced in your small intestine. Although it is naturally acceptable for your intestine to contain significant amounts of germs, bacteria overgrowth results in a much more extreme ailment. Not only that, but these germs don’t remain solely in your intestines for long. This is because all of the toxins accumulated in the body will leave the body through your pores, making them clogged and irritated. It is thus a widely accepted fact that this overgrowth leads to acne formation. In severe cases, this process can cause such an extreme increase of toxins in your body which, in time, may lead to a deficiency of vitamins in the body, or worse – a generally weakened immune system. This is not where the bad news end, either. In addition to hypothetically causing recurring irritation of your skin, omega-6 reacts strongly to your organism’s oxygen, as well as your bodily warmth. The result is an aggressive chemical process leading to what is dubbed as ‘zombie fats’. This type of fat results in a chain reaction within the body and subsequently results in the production of peroxidized fatty acids. This type of acid will eventually be synthesized into malondialdehyde which directly affects you adversely on a cellular level. It is therefore recommended that omega-6 acids are best kept out of your diet. While this toxin does not necessarily lead to acne by a direct correlation, it has been proven to aggravate certain types of cancer, such as liver and kidney cancer. I may also lead to malnutrition (regardless of how much peanut butter you eat), as well as to certain birth defects. You may thus be wondering, what on earth are aflatoxins? Aflatoxins are a certain type of toxins formed by a type of fungus classified in the Aspergillus genus. And, you guessed it – peanut butter is a plentiful source of it. Essentially, peanut butter’s aflatoxin is a result from the peanuts that make up the spread. If you happen to be a huge fan of peanuts, luckily for you, researchers have found that peanut butter reduces the nuts’ aflatoxins by nearly 90 percent. Surprisingly, this was found to specifically be the case with more expensive brands of the spread. On the other hand, there is evidence that peanut butter that is more cheaply made may contain a reduced amount of aflatoxins in comparison to more natural brands. It is hence quite hard to conclude whether or not peanut butter is actually the cause of the before mentioned conditions. Although the research is inconclusive, it is still undeniable that the following effects of the substance should make you reconsider buying your next jar of spread. While protein sounds like excellent nutrition, some kinds of protein can lead to problems with your digestive system. These are often found in various types of grains and, unfortunately, in legumes, as well. A unique type of protein called agglutinin can thus be found in peanuts. Peanut agglutinin is a particle that is absorbed by your body quite rapidly after consumption. For this reason, your system becomes highly vulnerable to intestinal complications. When your body absorbs certain nutrients as readily as this, it opens the borders of your intestines. This allows your intestines to take microscopic food particles into your blood. This is indeed as bad as it sounds. This process can be very harmful for your organism, as it isn’t mean to be able to absorb such large particles into your circulatory system. This may directly lead to all sorts of food allergies and certain types of auto-immune disorders. Additionally, it can also cause systemic inflammation. This kind of inflammation is more commonly referred to as ‘leaky gut’. This directly weakens your immune system’s activity. Your immune cells may thus have a harder time combating the toxins ingested into your body. What does that mean for your skin? You guessed it – it means pores that are filled with germs, appearing to the untrained eye as severe zit breakouts. Although it is clear that peanut butter, itself, can lead to various ailments that you may not want to face in your daily life, it is also safe to suggest that the issue may lie in the additional ingredients in the spread. In fact, the components that may be most detrimental to your skin may be the gluten and sugar that are used in the production process of peanut butter. While consuming more expensive kinds of peanut butter may save you in this aspect, cheap peanut butter contains a much larger amount of sugar and harmful fats compared to pricier brands. Cheaper products contain unhealthy hydrogenated oils which are used to make sure that the fats remain intact. In addition to this, it is no secret that sugar is the cause of various skin-related complications, such as clogged pores, glycation, skin irritation and increased sebum levels, as well as an overall lowered well-being of your entire system. The sugars used in peanut butter thus directly cause the blocking of pores. The bottom line is that if you feel your skin to be at a risk of acne, you should stick to healthier spreads as opposed to peanut butter. Conversely, if you are able to obtain a type of peanut butter low in harmful ingredients, it does not cancel its harm if consumed with sugary additional ingredients such as glutenous bread. Peanut butter is certainly not the most harmful food that you could add to your skin routine. While it is incredibly addictive, and can lead to other health issues, munching on a couple of spoon-fulls per day will not exactly cause you to break out into large boils. Still, if you are already suffering from a certain level of acne, you might want to simply cut down on this delicious snack, and opt for one of its alternatives. These include almond and cashew butter. They will allow you to enjoy a similar product without the harmful byproducts – in moderation, of course. In conclusion, what did we learn today in regards to our investigation of peanut butter’s effect on your complexion? Firstly, peanut butter is not always the leading cause of pimples, but it can contribute to the problem in combination with other foods. Still, peanut butter is rich in omega-6 fatty acids which may lead to acne-like inflammation. What is more, peanuts’ agglutinin only serves to aggravate acne. Indeed, almond butter and cashew butter are beneficial alternatives to this snack, while giving you the same satisfying taste.